When an Athlete or other Person has a case to answer for breach of the IAAF Anti-Doping Rules or the IAAF Integrity Code of Conduct, charges are brought by the Athletics Integrity Unit to be heard by the IAAF Disciplinary Tribunal, the independent first instance tribunal that hears all disciplinary cases in Athletics. The Disciplinary Tribunal began its operations in April 2017 and has jurisdiction to hear violations of the IAAF Anti-Doping Rules and the IAAF Integrity Code of Conduct that are alleged to have occurred on or after 3 April 2017. The Disciplinary Tribunal also has jurisdiction to hear complaints involving alleged violations of the former IAAF Code of Ethics. 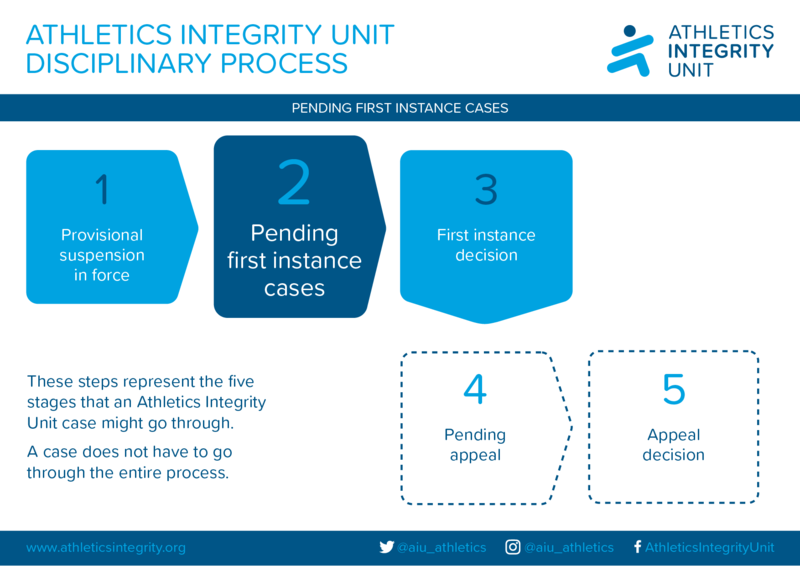 We are currently in a transitional period where some first instance cases that occurred before 3 April 2017 are still on-going and are being heard by the relevant tribunal at national level, or (in the case of Russian athletes where there is no tribunal at national level) before the Court of Arbitration for Sport (CAS) sitting as a first instance tribunal. In this section, we list the current Pending First Instance cases. Some of these cases will also appear on the list of Provisional Suspensions in force.